According to the Illy's roaster, caffeine content in the blend is less than 0.05%, which makes it very gentle on your stomach so you can drink it without having to worry in case of any medical contraindications for drinking of traditional coffee. 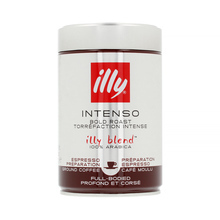 Illy espresso is coffee with thick chestnut crema. Its taste offers many flavours such as nuts, fruit and pleasant wood notes.